How Alertacall's housing management system has helped enhance the Livingwell service set up by Wheatley Group for older tenants. It has been a year since Wheatley Group set up its Livingwell service for older residents, and as part of this introduced Alertacall’s Housing Proactive system into approximately 1,000 properties. We were delighted to join in with Livingwell’s recent anniversary celebrations. Wheatley Group is Scotland’s largest housing provider, and last year committed itself to introducing changes which would improve the management of properties and enhance contact with tenants. 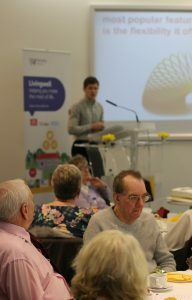 On 1st April 2018 Wheatley launched its new integrated Livingwell service for older residents. Central to these changes was the introduction of Housing Proactive, a housing management system for properties with higher needs customers. It enables housing providers to improve communications with residents, make it easier to report repairs and create significant service efficiencies. Residents are provided with an OKEachDay device, typically a phone, to report maintenance issues, and notify the Livingwell team if they are going to be away from the property. This in turn helps the Livingwell team with fire safety planning and the scheduling of maintenance work. Regular property checks are undertaken by the Housing Proactive team, and in the case of those admitted to hospital, discharge dates are monitored to provide comprehensive occupancy tracking reports. Wheatley are also able to use the service to disseminate important information to residents, from information on property maintenance or upcoming resident meetings, to the rapid distribution of emergency information, such as in the event of a power cut. In focusing on housing management and property-related issues, Housing Proactive has enabled Wheatley to focus on the wellbeing side of their service. Over the last year, Housing Proactive has had over 350,000 points of interaction with the service and our team. On 19th March 2019 we attended the first anniversary celebrations of the Livingwell service alongside residents and housing teams from Wheatley. Benjamin Lambert, Head of Client Relations, and Luca Malatacca, Client Relationship Manager, represented Alertacall on the day and delivered a presentation that looked at the work Housing Proactive has been doing alongside Livingwell. This reflected on the feedback we have received from residents using the service over the past 12 months. Amongst the outcomes of the past year, Housing Proactive has reported 385 repairs on behalf of residents, and made 1279 calls to check for early discharge from hospital. Importantly, we have received excellent customer feedback from a recent survey, with 89% of residents saying that they would recommend the OKEachDay phone and the Housing Proactive service to friends. In addition, at the CIH Housing Festival held in Glasgow in March this year, Alertacall’s director Martin Cutbill gave a joint presentation with Louise Dunlop, Head of Loretto Care (Acting), and Margaret Crawley, Wheatley Livingwell lead, on the subject of ‘Staying safe, Living well: Using technology to keep older people safe, in control and connected’. You can access the full presentation from the event here. Happy Anniversary Livingwell, and what a positive year it has been for us working alongside Wheatley and the Livingwell service! For more information on how your organisation and residents can benefit from our services, please email contact@alertacall.com or call us on 0808 208 1234.